Laid Off Loser: Laid Off Loser Album of the Day: "Houses of the Holy"
Laid Off Loser Album of the Day: "Houses of the Holy"
Dancing days are here again. Even if you're not a naked child climbing a rock formation. Zeppelin's best album gets better the warmer and sunnier it gets. And on this splendid spring day, I don't even mind suffering through "The Crunge." Whoa, now you just whoa there, Laidoffloser. Led Zeppelin does not have a best "album." They have a good song on one album and a memorable song on another album and a WTF moment on that album and so on. And who can forget that song about the cardio stairs workout. LedZep was created to inspire other bands and to give them something to cover ("Dancing Days" is a good example). Actually, like Star Trek's red matter, LedZep can be neither created nor destroyed. 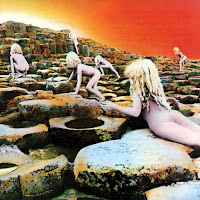 Though I have wished...In fairness, I can think of 100 bands from the '70s that aren't as good as Led Zeppelin. Been a long time been a long time been a long lonely lonely lonely lonely lonely time.